Guilty pleasure (defined): an activity one enjoys despite feeling that it is not generally held in high regard or is seen as unusual or weird. Most people use the term guilty pleasure in connection to the entertainment industry, but the majority of my guilty pleasures are consumables… Pop Tarts, Diet Pepsi, and in the fall… candy corn. If you were a fly on the wall in my office, kitchen, living room or car it would not take you long to discover that I am fairly regimented in my daily routines. I try, at all times, to maximize my own efficiency in hopes that there will be just a little more time to do x, y or z. This is why protein smoothies are my favorite lunch. I can easily eat-drink my meal during my daily commute to teach my 12:40 Intro to College Writing class. I’d be fine if we cut cable because I rarely watch TV and I make grocery lists to avoid extra trips to Target. I also usually select my reading and listening material base on what it will provide me, and often times, ENTERTAINMENT, does not top the list. What tastes does this publisher currently have? How does an established author handle diversity within their cast of characters? How can I sneakily place educational content in a narrative as it is done in THIS or THAT best-selling series? Earlier this month I even took a break from fiction to listen to industry informing podcasts. What can I say? I’m obsessed! I’m willing to do whatever it takes to be successful as a writer. Even if it means being unable to join in conversations about “This is Us” or comment on Taylor Swift’s outfit at the AMA’s. To me, writing time is just more important. I know. I sound like a snob. I’m sorry. Please know that I am not judging anyone else’s personal time habits. The motto that keeps the peace in my family is: “Everyone gets to pick!”. In fact, those who do regularly veg out are probably better for it. I know this because last week I discovered my own guilty pleasure. In saying that this book was my guilty pleasure, I am not in any way, shape or form saying that it or genre of the book is lacking value or less worthy of literary merit. Quite the opposite. I use the term guilt pleasure in connection to this book, because choosing to do something purely for entertainment for 14 hours felt so out of the ordinary for me… that I should have felt guilty I wasn’t following my usual-uber-productive routine. And if I hadn’t enjoyed it so much… I might have. So what is it? What did I greedily consume every available second? 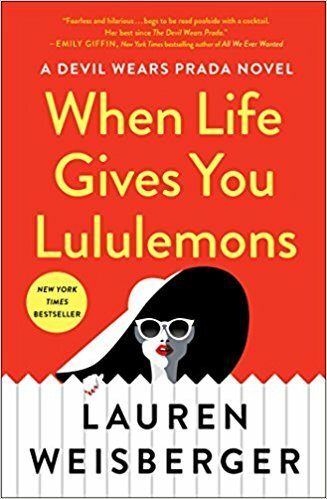 The audiobook version of When Life Gives You LuLuLemons by Lauren Weisberger. This book examined the thoughts of three, 30-something women in a way that was brutally honest and at the same time, down right hilarious. I found myself empathizing, relating, and laughing both with and at the characters. I was intrigued and appalled at their ultra-wealthy lifestyles. I was sucked into their drama, enchanted by their wardrobes and couldn’t wait to gobble up chapter after chapter. I suppose as I listened I did gain tidbits of author craft. I noticed when my jaw dropped as I drove down Copeland Avenue and hated on Karolina’s a-hole senator husband, and made mental notes of how to replicate that dramatic effect in a future project. I devoured the delicious details of the character’s clothing and paid attention to the way Lauren Weisberger expertly spooled out three narratives in a single story. I’m certain I learned things while listening to this book, but for the first time in a long time, learning was not my primary purpose. Entertainment was. This book brought me hours of relaxation and joy and escapism and THAT is a noble pursuit. Maybe even the greatest accomplishment an author can hope to achieve. Hats off to you Lauren on a job well done. You have won yourself a true fan! And even more so, succeeded in turning a work-a-holic into a binge-listening, chick-lit loving, word nerd. Let’s keep the good times rolling. In the comments, please share your favorite guilty pleasure read! If you loved this blog post, please feel free to share it with another word nerd or on social media. If you’d like to receive my weekly posts automatically, you can sign up HERE. Happy reading and writing. I hope to see you back here next week!